There are many ways that the reverse video technique can be applied; however, one of the best software options for adding these video effects is Adobe After Effects. This software is primarily used for creating motion graphics and visual effects, but it can also be used to animate, edit, and compose media space, including 2D or 3D space, with its variety of built in tools as well as third party plugins. Adobe After Effects consists of several panels, in which you can import stills, videos, or audio. You can also edit layers and timing using the timeline panel, and these are then displayed in the composition panel. This program is similar to many other Adobe programs, and is therefore reasonably user friendly to those already familiar with adobe editing software. 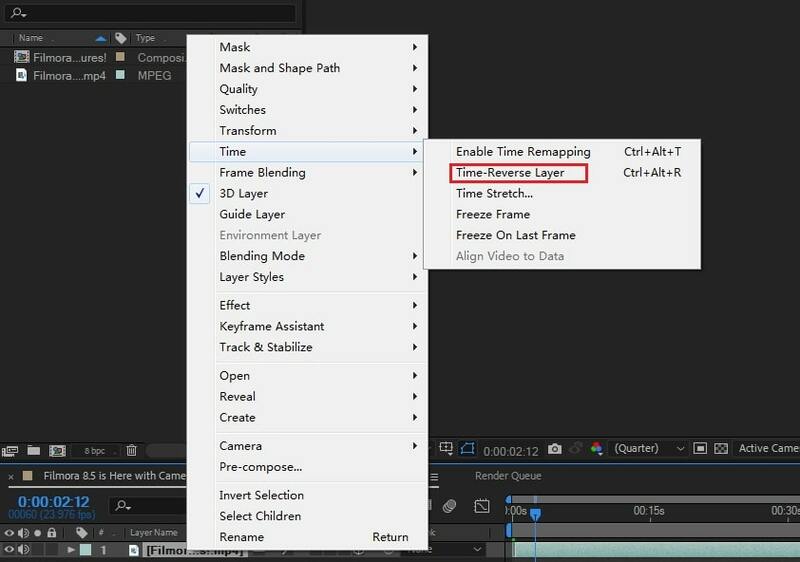 Next, we will examine how to use Adobe after Effects to reverse video. If you are finding an alternative to Adobe Affect Effects (yes, it is not free and it costs $19.99 per month) to reverse your video footage quickly, we recommend you to use Wondershare FilmoraPro. In FilmoraPro, you can reverse the video clip with one click. Besides the reverse effect, you can also change the video speed and correct the video color tuning easily. Download it now to have a try (Free). Below are the steps to reverse video. Drag the video onto timeline. Search "reverse" in the Effects panel. Now drag audio/time reverse to the timeline. Now you can see your video is reversed. Adobe After Effects is a professional editing software, after you are finished shooting your raw video you can utilize this software to edit your video to its final form. Here, we will walk you through the step by step process of using this professional editing software to reverse video. 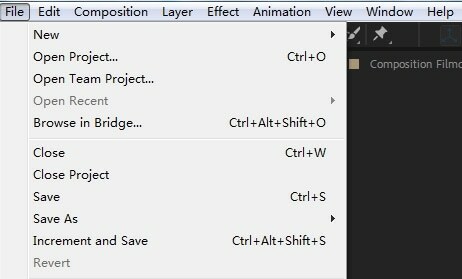 Ensure that Adobe After Effects is installed on your home or office computer. It is not freeware (US $20.99/month), you can purchase through Adobe via an online download. It is compatible with both PC and Mac Computers, also. Open the project containing the clip that you want to reverse the video on. For safety and file backup, save the section that you are adding effects to as a separate file so that, if you do not like the final effect, you have the original footage as a backup. When you do this, it will open a new display window that will allow you to adjust the speed of the clip and make other selections relating to the reverse video effect, such as speed, contrast, and other effects. Make your selections depending on the effect that you are trying to achieve. After you have made your reverse video selections, click on the RAM preview to check the result and then save. A shitload of words just to say "Layer>Time>Time Reverse Layer" or "Ctrl+Alt+L"